How do I listen to and download the audio? Listen by clicking play in the top left of the page, above the menu icon. The button next to the play/pause button rewinds five seconds, the 0.5x button plays the audio at half speed and the last button plays the audio continuously. To download the audio, click the download icon attached to the left of the play icon. Known Words are words you have learned. There are three ways to make words known on LingQ. Click the I know this word button on the blue pane which shows when you click on a blue word. Change the status of a word on the yellow panel to 4 (Learned - Review in 30 days) or ✔ (Known - Review never). Do this when you are reading an article and find that you know a yellow word or when reviewing using the vocabulary activities. A LingQ is a word you are learning. Creating LingQs is key to the LingQ system. The more LingQs you create, the more words you will learn and the quicker you will progress in your target language. When you open a lesson you will see all words that are new to you highlighted in blue. Your goal is to make those words white (you know them) or yellow (you are learning them). When you make the blue words yellow, you are turning them into LingQs and they will be yellow in all future lessons until you have learned them. How do I make LingQs? For every new word highlighted in blue you can see community translations that have been used most by other LingQ members. Choose one of these translations and the LingQ is saved. If you’re not happy with any of the community translations, you can use one of the many online dictionaries to create your own. Simply click on a dictionary then copy and paste the translation into the translation field. How do I LingQ a word with more than one meaning? Start by adding the meaning that shows first and add the other meanings as you come across them. You can either edit your existing translation or click + to add a separate one. How do I record my listening and reading? Listening and reading times are tracked automatically by the LingQ system. When you reduce your new words to zero for a lesson, you are credited with having read the lesson one time. When you have listened to the audio all the way through for a lesson, you are credited with having listened to the lesson one time. You can manually change the times you have read and listened by clicking to view the menu panel inside a lesson. Your words of reading and hours of listening will also be added to your overall statistics, which can be found on your profile page, and can also be manually adjusted there. Is there a LingQ mobile app? Yes, you can find the iOS app here and the Android app here. How do I get my blue words back? You can’t get your blue words back, but not to worry, you can LingQ or Ignore any terms you have previously moved to known. Just select a word and the blue popup will appear. Any words you LingQ or Ignore will be removed from your Known Words and your statistics will be updated accordingly. Blue words show you which words are new to you so you should not keep them around. Every time you see a blue word decide whether to LingQ it, make it known or ignore it and move on. Absolutely! Just make sure to select the correct level when choosing a course from the New Course popup on the Learn page. We even have a set of guided courses for beginners in all supported languages. Yes, you can. Choose as many languages as you like from the list next to your username in the top right corner of the site. How do you deal with grammar on LingQ? Our tutors will identify grammatical problems you are making in your writing and speaking and explain any relevant grammar concepts in the reports you receive. You are also free to ask your tutor any questions about grammar on the forum or when communicating with them. While we do not stress grammar instruction here at LingQ, we recognize that people are curious about the structure of the language they are learning. One solution is to buy a small grammar book and read it from time to time. Try to avoid relying on grammar rules as some kind of filter that you have to pass all of your thoughts through before you can say anything. How to I find and manage external dictionaries in the Reader? The LingQ Reader is integrated with many third party dictionaries and resources. To find them click the All Dictionaries link on the blue or yellow panel when looking at a word. * Make sure to disable your popup blocker on the web for the dictionaries to open. On the mobile apps, these dictionaries are embedded. Add dictionaries from the Available Resources. The dictionaries with the red x are the ones you have added to your Selected Resources. 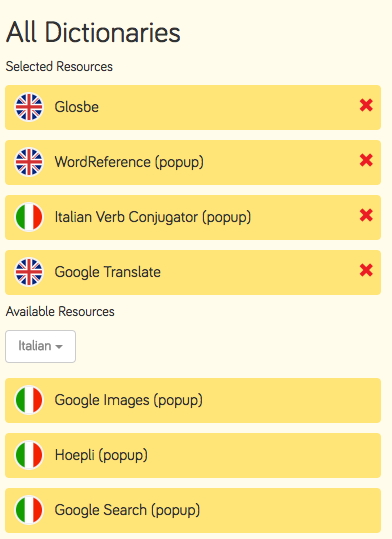 Change the dictionary language to see available resources for different languages and add as many as you like. Selected Resources appear in your blue panel when you click on a blue word. If you click the x beside any of your selected resources, they are returned to the “available” list below. How do coins work? What do they mean? LingQ rewards you for learning and knowing words. When you create a LingQ or make a word known you earn coins. The number of coins you earn depends on the value of the word. The most common words are considered more valuable and are worth four coins. The less common a word is, the fewer coins you will earn. The number of coins each word is worth is shown on the blue and yellow widgets. If you make a word known, you earn 5X its value. Creating a LingQ earns you 1X the word’s value. Increasing the status of a word earns you 1X coins per status increase until a word becomes known (✔). That means you can earn a maximum of 20 coins for the most valuable words and 5 coins for 1 coin words! You can use coins in the Avatar Store and buy clothes and accessories for your growing avatar. Did you not find the answer you were looking for? Try posting your question on our Support Forum to get an answer fast. Email LingQ Support. During our business hours, M-F 8am — 6pm (Pacific Standard Time) we will normally respond within a few hours. Still have questions? Try these other help resources. How do I learn on LingQ?